No more than 5 paces away from our van at the top of Lookout Hill “Quick, Stuart into the van, we must go now!” Godfrey shouted. The race was on. Over the airwaves the wardens had called in that the wildebeest gathered beside the Mara River had started to cross. As we sped down from the heights of Lookout Hill, from all around, there were vans heading towards the river. This truly was a race. There is only so much space along the river bank from where you can get a good viewing point and we wanted that space. As we arrived at the rivers edge, the crossing was in full flow. Thousands of wildebeest were lining up and jumping in to the river and struggling to get to the bank on the far side. Within minutes the last few were in and making their way across. Some of the younger stragglers for some reason turned back, maybe the current was too strong for them. Once back where they started, the stragglers made their way up and down the bank to attempt another crossing. Out from the shadows on the far bank, a very slow moving object swam towards one of the young calves that stood in the waters edge. The biggest Nile Croc I had ever seen was heading straight for the calf. Slowly, the crocodile swam towards it with unbelievable speed, launched itself from the water to grab the young wildebeest by the head. Within less than a second it had grabbed the wildebeest and dragged it under. Godfrey had managed to get a perfect spot on the river bank, out of 40+ vans positioned on the side of the river, we were the only van in a position to witness the ferociousness of the Nile Croc. For the next 4 hours we waited for the herds and pressure to build in order for the wildebeest to cross again. They have very poor eyesight and throughout the day, they would move down to the water’s edge then move back again to safety, their behaviour is intriguing, so indecisive! If there are no Zebra to lead the way, then wildebeest will go back and forth all day long. If a super herd is formed at the rivers edge, then the wildebeest on the edge of the river bank are more than likely to have no choice but to jump in and cross. Once this happens then the rest will follow. Life and death is all part of existence in the Mara. Many wildebeest die from drowning as they break their legs jumping into the river from a height. Some get taken by crocs, and some, rarely, are attacked and killed by a bull hippo from one of the many pods that share the river. The crossings present many opportunities for other predators to try their luck. Leopards and female lions will come to the river in the chance of an easy kill. The river is a dangerous place to be, but year after year the wildebeest make this life threatening journey as part of their fight to survive. The alarm rang out and it was time to get up, get dressed and make our way up to the tea and coffee station for a hit of caffeine before our 6AM drive out in to the Mara. At 05.30am it was still dark and there was a nip in the air, the rain was still falling as it had been all night, we just new it was going to be one of those days! As we drove out of camp and headed into the bush, we heard over the radio that two Black Rhino had been seen not far from camp, so we headed off to find them. Once we arrived at the area they had been spotted, there were several vans parked up and all were looking in to the bush area beside us. The Rhino had made their way in to the dense bush and could not be seen. We decided to stay for a while in case they came out, but after nearly an hour we decided to move on. For the next hour or so we were slowly driving around on the look out for any animals of interest. Then suddenly over the radio, “Godfrey, come in Godfrey…….” it was James, one of the rangers we gave a lift to earlier in the week. James was asking Godfrey to meet at a certain point in the Mara. Godfrey turned to me and asked if we wanted to meet up with James. We had nothing to loose, maybe there would be some game or with a bit of luck one of the big five over in that direction, so we decided to go and find out what James was calling us over for. When we arrived at James’s location, to our surprise James had found four lions feeding on a kill from earlier in the night. 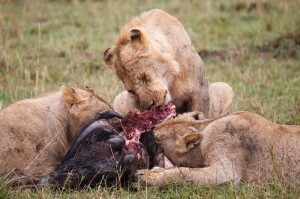 80% of the wildebeest was gone, this was a big feed for the whole pride. As we sat in our van next to James’s van, James told us he heard Godfrey on the radio asking if any one had seen lions this morning, and to show his appreciation for the lift we gave him on our way in to the Mara, he wanted share his find with us, hence the lack of information given over the airwaves. So it goes to show, if you do a good deed the favour will be returned when you need it. We sat and watched the Lions feed for almost an hour before any other vans arrived. When they did it would be time for us to leave and make our way back to camp for our own breakfast. Designed to kill, they stalk with stealth and attack in a group. The only big cat in the world to have a social network. The lion is an amazing animal, and in the wild their true power can be seen in full glory. The day before we had seen a pride of lions in the distance which were coming down from the rolling hills bordering Tanzania and Kenya. We stopped on the dirt track and could see that they were looking for food. Behind us was a small herd of wildebeest numbering 30 strong. The mother of the pride was assessing the situation for a kill, but there was no cover for the lions to utilise in order to get close to the herd for an attack. After a few minutes the pride walked off into the distance. After breakfast we had planned to drive to the river to watch the wildebeest crossing, this was 50 km away from camp and as we drove out of the gates, we heard on the radio that there had been a lion kill not far from the airstrip. As we got closer to the kill site, we could smell in the air the potent stench of death, we were close by. As we arrived we quickly counted the lions in the pride. There were 14 lions in total, several females and many young males, but no big male. This was the pride we had seen the day before, and that night, just after dark, we could hear the male near camp calling out marking territory. The pride must have had a kill in the night as there was not much left of the large wildebeest when we arrived. The pride were clearly satisfied and full, as some of the young males were playing and others were rolling around in the short grass. It was enthralling to be able to watch such a large pride interact with each other. As they approached one another they would rub heads and against each other’s bodies. In a way it felt like they were congratulating each member of the pride for a job well done. 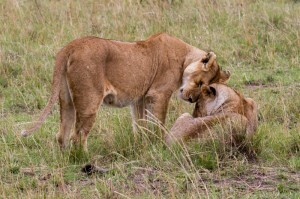 Even the smallest cubs of the pride were relaxing and showing affection to their siblings. There has been many years of research and study on Lion prides in Kenya and Tanzania, trying to understand why Lions are the only big cat with a social network. To date there is no definitive answer to why this is. With the ever encroaching human population on the Lion’s territory, will we ever understand them fully, or will we forever be second guessing long past their existence? Driving through the bush looking for leopards we heard a rumbling. Slowly it got louder and louder until out of the gap between the bushes came the Wildebeest! Before we knew it, we were caught up in a mighty stampede of them passing through, amazingly they all kept to single file as they passed by. For five minutes my wife counted the wildebeest whilst i tried to get a panning shot of the action, after nearly a 1000 she gave up. “Wow, how many are there, when will this end, its amazing” I heard her say to Godfrey. The noise, the volume of animals and the luck was truly incredible, we could have been anywhere in the Mara but no we were right in the middle of it. After fifteen minutes from when it all started, we decided to move on when a gap appeared. 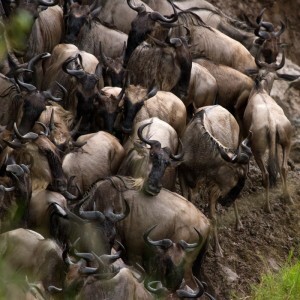 There must have been over 2500 wildebeest pass us, and when we left they were still flooding by. Driving up the A1M looking up at the sky, I hoped the rain would ease. I was on my way to the English School of Falconry. 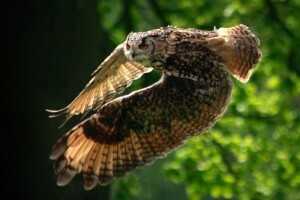 The ESF has many different raptors ranging from small owls to bald eagles. This was my first shoot involving birds at close range. I had made attempts to shoot snake eagles and kites in the Masai Mara, but could not quite get a good image of them in flight. Not all birds wanted to play ball on the day, but the ones that did were spectacular. Shooting birds is extremely tricky, but the rewards are exhilarating. The ESF offers a great opportunity for practice. The falconers are extremely knowledgeable, giving advice on what the bird might do next, helping to get those great shots. By the end of the day, the sun was out and we managed four flights with the star of the venue, an 18 month old bald eagle, the aim of thee shoot was to fly over the lake and get shots of him picking his prey from the water surface. Whilst the bald eagle was fun to shoot, my favourite was the red kite. Maybe a trip to the Welsh countryside to capture this magnificent specimen in the wild is called for. After three hours searching for a lioness and her cub, we decided to head back to camp. Our guide Godfrey was disappointed that this was the first outing in ten days that we did not see what we had planned to. Suddenly, running across our path, being chased by its mate was a spotted hyena. The mood quickly changed as Godfrey shouted to me at the back of the van, ”Hyena! …. with a kill! …. hold on!”. Foot down we were in hot pursuit. As we drew closer to the hyenas, they started to fight over the catch. Probably a kill from a leopard or cheetah that the hyenas had stolen. Obviously not willing to share with each other, they savagely snapped and snarled. Hyenas have the strongest jaws and bite power on the planes. Being bitten by a hyena would cause serious damage. 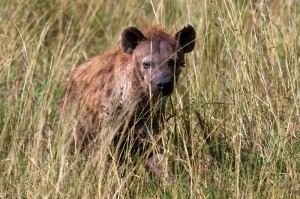 Hyena’s steal most of their food, but they do bring down prey when times are hard. Hyenas don’t humanely kill their prey like a lion does. As a pack they mob their victim, and while some hang on to the defenceless animal, the others start to tear it apart. All of a sudden, one of the hyenas won priority over the meal. From our van, we could hear the bones crushing one after another as the Hyena broke its way past the rib cage and in to the tender inner’s. Cheetah, the fastest land mammal. With a top speed of seventy miles per hour, there’s not much that can escape this swift agile cat over a short sprint. Normally the cheetah hunts alone, but when a female has cubs nearing maturity, then hunting as a pack can prove successful but sometimes testing. 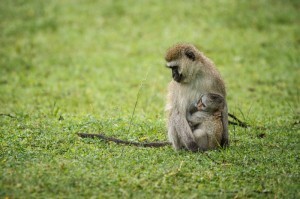 As the rains came down, activity on the plains of the Masai Mara calmed down. For two hours we sat and watched a lone thomson gazelle move closer to the bush with great caution, as spectators we could sense the tension. Shakira and her three cubs lay in the grass ahead waiting for the rains to ease. At this point all four cheetahs lay facing away from each other looking for the next opportunity. One of the cubs had a firm fix on the nervous gazelle, patiently waiting for it to draw closer (A cheetah will not waist energy in a pursuit if the target is more than a short sprint away). As the rain stopped, the gazelle froze. It was now all too aware of the dangers ahead. After a few minutes assessing the area around it, the thomson gazelle ran in to the distance away from the hunters. The next day, as dawn broke, we followed Shakira and her cubs along the flats beside the Mara River. For several hours she guided her cubs over the open land keeping a watchful eye on the nearing herds of gazelle. Suddenly from across the plains three topi antelope charged the pacing cheetahs. Two topi veered off to the small herd of nearby gazelle, and as if they were shepherds, rounded up the gazelle and escorted them to safety. While the remaining topi faced off our hunters. After a short rest and a refreshing drink from a rainwater puddle, Shakira spotted another lone thomson, this time she had a plan! 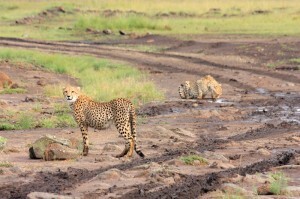 While Shakira sat on the crest of a termite mound, the three cubs dispersed. Two headed left and one turned right. On the left, one of the cubs started to crouch down whilst the other continued to move round. A classic pincer movement was being formed. The aim, to push the thomson closer to Shakira for a deadly attack.In an attempt to confuse the young cubs, the herd of gazelles regrouped with its stray companion. Now the cubs became unclear on what to do. Shakira clearly had more teaching to do before her students could graduate. With a frustrated look, Shakira and the cubs retired in to the bushland to escape the increasingly searing sun. The most accomplished climber of all the big cats in Africa, agility combined with the strength to carry twice its own body weight enables the leopard to kill and store its prey in the trees for several days before the need to feed. Although it has been known for lions to climb trees, they do not have the strength to carry a kill off the ground away from other predators. 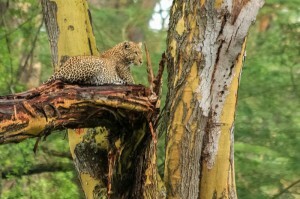 Through the daylight hours, you are most likely to find a leopard resting up in the branches of a tree. Whilst driving through the forest area, along the edge of Lake Nakuru, our driver suddenly came to an abrupt stop. Leaning out of the driver’s window, Godfrey pointed deep in to the woodland “There Leopard, can you see?”. Every time I think about this moment, I still can’t believe how Godfrey saw this leopard. Not only was it over 50 meters away, but we needed to reverse our vehicle 20 meters or more to a clear opening in the trees to see it. This was a proud moment for our eagle eyed guide, as quickly as the Leopard was spotted, the location of the sighting was passed around all the vehicles in the vicinity. I’m sure Godfrey was the hero of the drivers camp later that night. After a fantastic experience of being within inches of African Buffalo, we decided to retreat the terrace bar for a cool drink, the bar looked out over the water hole where the Buffalo were still happily grazing away. Little did we know there was a highly skilled thief about, as we relaxed with our drinks and looking over the images we took of the Buffalo, we could hear a “Clink, Clink” sound, my wife said that sounds like a tea cup and spoon. As we looked out over in the direction the sound was coming from towards our room, that was on the fourth floor, on the far side of the four story high wooden mountain lodge building. We could see a Vervet monkey sitting on the edge of the rooms balcony, it took a while, but when it registered that, that was our balcony and it was my tea cup the Monkey was holding and drinking from, we soon chased back to the room. On entering our room we were relieved to find that we did shut and lock the door before we left to photograph the Buffalo. But in our haste to be the first in the viewing bunker we had left our tea and books on the balcony! My wife desperate to not loose the items left outside opened the door and the monkey made a dash for it, as my wife turned around the monkey reappeared with its head around the corner post make a screeching call and reached out for the tea cup. Not expecting the monkey to reappear we both ended up on our backsides on the floor. Lesson one learned; never leave any door, window, bag or anything you don’t want to loose, exposed for a Vervet monkey to have away. unfortunately the monkey did get the better of us and the cup came to a shattering end. 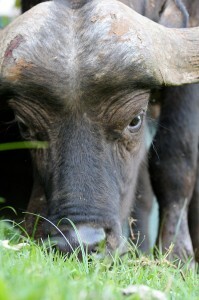 African buffalo, the most dangerous animal in East Africa. The Masai people will fight off lion and leopard with their sticks, but if they come across a buffalo, they will keep a safe distance or change direction to avoid them. It is commonly known that a lone bull can be seen charging and attacking a tree for no apparent reason. This is said to be a way of releasing frustration for being excluded from the herd it was accustomed to by a younger bull. This unprovoked attacking helps earn the buffalo its aggressive reputation. From the security of an underground viewing bunker, I was able to photograph buffalo from up close, without becoming a threat to the buffalo or putting myself in danger. Several Buffalo came within inches of my lens, the hot steamy breath they exhaled as they grazed on the fresh grass at the edge of the bunker, could be felt passing over my hands that were wrapped around my camera. If I dared I could have reached out and touched them. Aware of my presence, the females of the herd continued to graze around the bunker with grace, not phased by my movements, quite literally under their noses. When a bull came close and I positioned myself for a shot, immediately I had eye contact with him. In his eyes you could see him calculating was I a risk, should he charge me. Looking back on this moment, I do wonder how close was I to being charged, what was the deciding factor for him not to attack.